Stars came out for the red carpet premiere of Loving the Silent Tears: A New Musical at the Shrine Auditorium in Los Angeles. Among the stars who attended were Jon Huertas, Corey Feldman, Kyson Lee, Craig Robinson, AJ Buckley, Kristoff St. John, Kelly Packard and many more. The first of its kind in theatre history, Loving the Silent Tears took the audience on an elevating journey across six continents and 16 countries, to tell a compelling story about humanity’s search for inner peace and happiness. 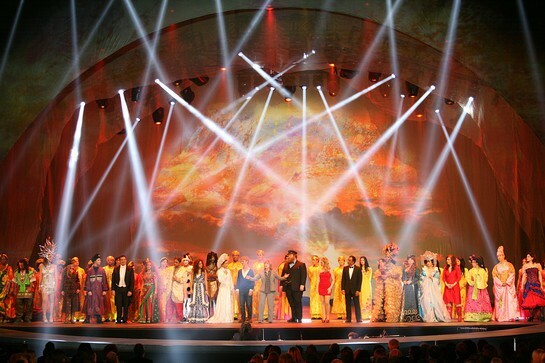 With all elements in place that made for absolutely thrilling musical theatre, the show was inspired by a poetry anthology titled Silent Tears, written years ago by world-renowned spiritual teacher, humanitarian and artist Supreme Master Ching Hai. The musical starred 2-time Grammy-winning artist Jon Secada, Grammy-winning icon Jody Watley, and Broadway stars: Tony winner Debbie Gravitte, Tony winner Kiril Kulish, Emmy winner and Tony nominee Liz Callaway, and Tony nominee Patti Cohenour. They were joined by Grammy-winning reggae legends Black Uhuru, Arab singer Camellia Abou-Odah, Italian tenor Mark Janicello, Korean pop star Brian Joo, award-winning Israeli singer Liel Kolet, Irish soprano Katie McMahon, Korean singer Heather Park, award-winning Brazilian singer Fabiana Passoni, Persian superstar Siavash Shams and Chinese platinum pop star Kay Tse. Loving the Silent Tears was directed by Tony nominee Vincent Paterson (Michael Jackson’s Bad and Madonna’s Blond Ambition tours), the lively dances were choreographed by Emmy-winning Bonnie Story (High School Musical), the imaginative stagecraft of Emmy-winning set designer John Iacovelli (Peter Pan), and a vibrant display of costumes were created by award-winning designer Sharell Martin (Chicago). Celebrities, dignitaries and special guests turned out for this special one night only celebration, with proceeds benefitting Broadway Cares/Equity Fights AIDS, Animal Defenders International and World Wide Veterinary Service. Each organization received $100,000 each for a grand total of $300,000 given to charity.